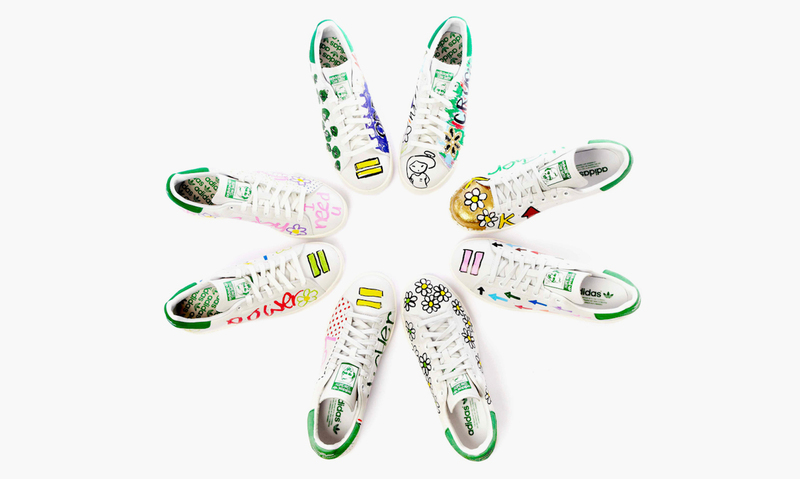 Following up on the announcement of his Adidas x Originals collaboration, Pharrell Williams is showing the brand more love with a limited-edition collection of 10 Adidas Stan Smiths styles that have been hand-painted by the designer and will be available exclusively at Colette in Paris. But on his quest to perpetuate happiness, Pharrell and Adidas will be donating all of the profits to the artist’s charity foundation From One Hand To AnOTHER. The charity develops learning programs for underprivileged youth from the ages of seven to 20, and empowers them through technology, the arts, and media. The project goes by the name Adidas = Pharrell Williams and further products will drop this August. You can also catch a glimpse of Pharrell wearing his own customized Stan Smiths in W‘s latest art issue (on page 56), which he does cover duties on as well. Looks like Pharrell is putting his best foot forward these days!